Ideas Box is a pop-up library and media centre, with web access and power, to equip people living in refugee camps and post-emergency situations with education, information and culture. While humanitarian agencies rightly focus first on meeting refugees’ basic needs—for food, healthcare, shelter and clothing — with the average stay in a refugee camp now running at 17 years, there is increasing recognition that the world’s 52 million refugees also badly need ways to counter trauma, boredom, isolation and despair. Ideas Box, a collaboration between Libraries Without Borders and UNHCR that launched in October 2013, delivers the tools so communities can do exactly that. 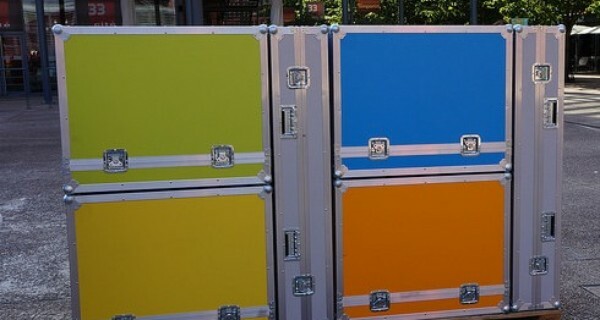 ‘The box’ actually consists of a series of lightweight, robust, waterproof crates, brightly colour-coded by content, designed to be carried on shipping palettes. The containers unpack to make desks and chairs for up to 24 people, but it’s what’s inside them that matters: each unit contains an eye-popping array of kit—15 tablet computers, 4 laptops, satellite internet and or 3G coverage; 50 e-readers, 5,000 e-books (tailored to the camp), 250 printed books; digital learning content, running from Moocs and Wikipedia to TED and Khan Academy, literacy workshops and professional training; a TV screen and built-in projector for cinema screenings plus 100 films, including documentaries and cartoons; video games and coding training; 5 HD cameras for participatory journalism and filmmaking, GPS for participatory mapping; plus a built-in stage for theatre arts and crafts. The crates were designed, for free, by Philippe Starck, who says, ‘Inside it’s not toys, it’s doors — doors to an open mind, thousands of different universes.’ Resources are all tailored to the box’s destination, with learning content customised to complement the local national curriculum. A two-year trial across five refugee camps in the Great Lakes area (Burundi, Rwanda and DRC) began in February 2014, with priority areas including Syria, Jordan, Lebanon, Iraq and Turkey, CAR and Darfur. The arrival of a box in communities where it is possible to feel cut off from everything from education and information to training and play, marks a ‘return to normality, a moral boost, a great opportunity and an emotional and psychological shot in the arm,’ says the National Geographic. Each unit, manned by local facilitators, costs $60,000, with 5,000 expected users per box. The Soros Foundation gave $400,000 in seed-funding to start the project, and corporates can contribute cash, tablets, laptops and generators.